There’s just something synonymous about holidays and chocolate. It’s a dessert that you can dress up for a grand Christmas party or dress down to create a casual dessert for a fourth of July picnic. It’s all in the execution. Holiday cakes not only taste delicious, but they can play an important role in your table’s holiday decorating scheme. Chocolate covered mint leaves make a beautiful garnish for a holiday chocolate cake and are simple to make. To get started, get some baker’s chocolate and follow the instructions on the package to melt the chocolate. Using a double broiler is best in this case, but you can also use the microwave if you do it in short bursts; use medium heat for this heating method. After the chocolate is melted, dip cleaned, whole mint leaves into the chocolate. Use a long set of tweezers to keep your fingers out of the melted chocolate. Give the extra chocolate a few seconds to drip off the leaves and then place them to cool on a piece of wax paper. If you drape them over a small cup or rolling pin, the leaves will take on a pretty curled shape, which looks nice on the top of the cake. Frost the cake in question. Any type of frosting will do, but a fondant will create a smooth texture that works very well with your decorative leaves. Once you frost the cake, garnish it with the leaves to create an arrangement on the top of the cake. To bring additional color to the creation, place berries, kiwis, or cherries in the middle of the leaf arrangement. Keep a few of the frozen mint leaves in a Ziploc bag to decorate future cakes and desserts. 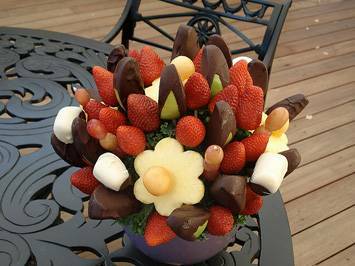 The fruit bouquet is a nice bring along item for a party. It adds a chocolate twist to the traditional fruit bouquet, which normally acts as the appetizer for a summer party get together. 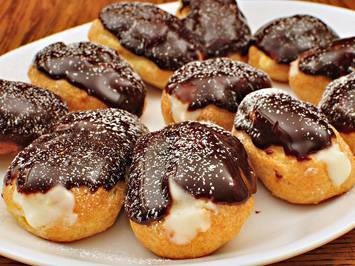 However, once the fruit is dipped into the chocolate, it suddenly becomes dessert instead. Cut up pieces of fruit like pineapples, apples, melon or star fruit, and clean off fruits like strawberries, leaving the leaves on them. Finally, peel an orange and take it apart so that you have individual orange sections. Dip each piece of fruit into melted chocolate, leaving one side exposed and place on a sheet of wax paper until the chocolate cools. Place each of the chocolate-covered fruit pieces onto a wooden skewer, making sure that you insert the skewer on the side of the fruit not covered with chocolate. Fill the skewers as you normally would to create a fruit skewer. Create a base for the fruit skewers by cutting a melon in half and inserting the skewers into the melon. While most people would like to think they can create all their holiday chocolate treats from scratch, a lack of time, unexpected guests, dessert disasters and other mishaps can make life a bit easier on the host. One of the best sources of chocolate dessert inspiration just might come from the frozen food aisle. The prepared holiday host will shop for frozen chocolate items on a regular basis, picking up items like frozen chocolate cakes, some chocolate eclairs, or chocolate pies. Adding a bit of her own touch makes these desserts seem like scratch, but in much less time. For example, a savvy chocolate chef can create a scrumptious holiday cake by adding a bit of chocolate syrup, some thawed raspberries that have been cooked in sugar, and a few of the chocolate mint leaves to the top of a frozen three layer cake. Garnish the cake with berries, and this chocolate dessert is done in no time. 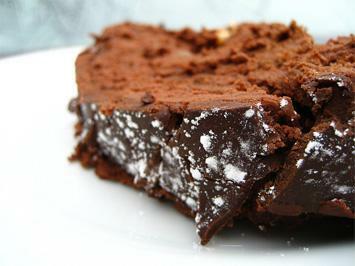 Chocolate is a baker’s staple and a delicious treat for any holiday meal. With these holiday chocolate ideas, you’ll please even the most ardent chocoholic in your midst and be the life of any party that you attend if you have one of these treats on hand. Becky Harris the author of the “Chocoholics Holiday Ideas” also writes for U-Pack, a company helping customers pack away their treasured memories with Upack portable storage containers.